Sony was showing a new customisable iPod dock device at this week's Gadget Show Live event at the Birmingham NEC, which uniquely gives users the opportunity to design the look of the sound system's front panel. If you don't like your design for your new 'Sk8' iPod dock, then you can merely take out the paper that you have sketched or printed it on and try out another one. Sony reps were only able to tell us that the Sony Sk8 is currently still at the concept level and that there was no news on any plans for a commercial release just yet. 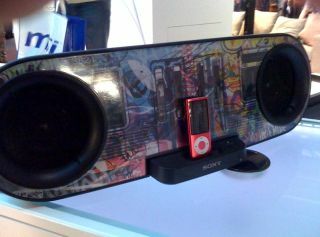 However, that said, there is already a listing online at HMV.com for the Sony Sk8, with pre-orders being taken for the device, priced by HMV at £169.99 with a planned release date of 1 June 2010. It is certainly an interesting design strategy, and one which is bound to appeal to younger users who like to scrawl over and personalise their kit. However, if that HMV pricing is anywhere near correct, the quality of the output is going to have to be something pretty special to warrant spending that amount of money on an iPod dock, with the iPod peripherals market being incredibly competitive. We should hear more from Sony's Product Manager on the company's plans for Sk8 later this week, so stay tuned for updates right here.